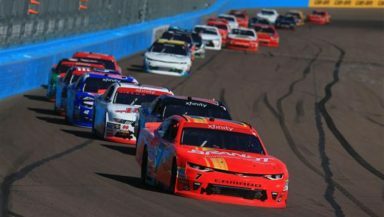 Justin Allgaier’s Crew Chief Jason Burdett has been fined $10,000 and suspended for the NASCAR XFINITY Series finale at Homestead following an L1-infraction issued after Saturday’s post-race inspection at Phoenix Raceway. The No. 7 NXS team has also been penalized both 10 driver and owner points heading into the weekend, although they will still remain in the Championship Round at Homestead. According to NASCAR’s statement, both team and Burdett were penalized for a rear-brake assembly cooling issue, which is in violation of Section 20.15.2.2, which states that rear brake cooling assemblies must be sealed from inlet to exhaust. As a result, Allgaier’s 10th-place finish Saturday is encumbered. We’ll bring you more as the story unfolds.